Having grown up on a working cattle ranch just south of Austin Texas, I spent my childhood fishing, camping, horseback riding and enjoying all things outside. My passion for the outdoors is two-fold. First, being outdoors always takes me back to that “happy place” of my youth. It is so easy to be transported to that time of innocence and awe that you felt as a kid when you are looking down into the Grand Canyon. Second, the whole newness of the outdoor life really appeals to me; from exploring new areas to learning new skills, there is always something new around the bend. My interests include outdoor cooking, overlanding, and camping in general. Every summer my family would pack up the mini van for an across country tour. We'd spend two weeks crisscrossing a section of the US. One year it would be the Mid West, the next New England, or the South West, or Texas. My parents didn't believe in hotels so we camped everywhere. From Florida to Maine and from Virginia to California. After graduating, I was fortunate enough to backpack on the Appalachian Trail and around Italy, Switzerland, Austria and Germany. I have an ecstatic passion for backpacking and going places that only your feet can take you. A car, plane or boat can get you to the wilderness, but you don't quite experience it until you are far away from everything with all your belongings on your back. My interests include ultralight backpacking, hammock camping, and kayak fishing. My earliest memories of camping are from when as a young boy; I woke up in the night to find an owl had landed on and collapsed part of our tent while camping in Maine. From then on I have been enamored with not just the beauty and serenity of nature, but also its spontaneity. I was lucky enough to find someone to share my life with who shares the same passion for the outdoors. When my wife and I went on our honeymoon, we elected to go camping for the week. We have made this a tradition and continue to go camping every week for our anniversary and have taken our son on our trips since he was two years old. Appreciation of the outdoors has been in my family for generations and my hope is to pass that appreciation along. 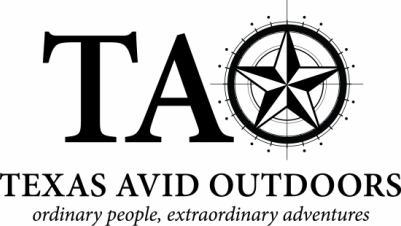 Texas Avid Outdoors is an opportunity to help other families get outdoors as well. My interests include photography, backpacking, canoeing, and camping.